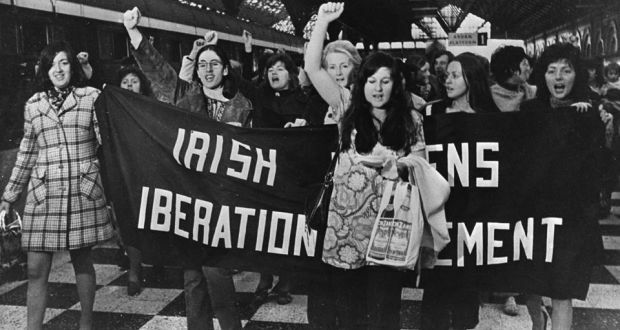 On May 22, 1971, forty-seven members of the Irish Women’s Liberation Movement (IWLM) boarded the 8am train from Dublin to Belfast. Their aim was to purchase contraceptives in the north, where contraception was legal under UK law, and to travel back to Dublin with them in order to highlight the hypocrisy of Irish law, which banned the sale of contraceptives. After arriving in Belfast, the group of women went into a chemist shop, followed by the reporters and cameras from the international press. Many of the women did not realize that most types of contraceptives required a prescription. Fearful of the stunt collapsing, Nell McCafferty, one of the IWLM founding members, had a clever idea and purchased hundreds of packets of aspirin. McCafferty dispersed these among the group, with women instructed to pretend they were birth control pills and to swallow them in front of the customs officials in Dublin.1 Other women purchased condoms and jars of spermicidal jelly. In the decades following this protest, the issue of reproductive rights has continued to prove contentious in Ireland. In 1983, a bitterly divisive referendum resulted in the enactment of the eighth amendment of the Irish constitution, which recognized the right to life of the unborn child. Since then, activists on both sides of the debate have fervently campaigned either for the repeal or retention of the eighth amendment. In particular, since the death of Savita Halappanavar in October 2012 from complications from a miscarriage after being denied an abortion, Ireland’s reproductive rights have come under sharp focus again, and there has been a reenergizing of both the pro-choice and pro-life campaigns. But the story of reproductive rights in Ireland has a longer history. In the 1970s, not only the issue of abortion, but also the question of the legalization of contraception produced similarly polarized views. Contraception was made illegal in Ireland with the enactment of the Criminal Law Amendment Act, which forbade the sale, import, and advertisement of contraceptives.6 From 1963, the contraceptive pill could be obtained with a prescription as a “cycle regulator,” and in 1969 the first voluntary family planning clinic opened in Dublin. This clinic, called the Fertility Guidance Company, provided contraception to the urban middle-classes who paid a donation, rather than a fee, in order to navigate the law. Others would gain access to contraception by traveling over the border to Northern Ireland where contraception was legal under UK law, or through mail order services. The IWLM was a largely middle-class group of Irish women including left-wing activists, trade unionists, journalists, and stay-at-home-mothers. The IWLM was concerned with the legal inequalities facing women in the workplace, home, and education, and viewed the legalization of contraception as being a “basic issue of women’s liberation.”8 The group organized walk-outs from Catholic masses as well as demonstrations in order to campaign against the existing contraception laws. Members of the IWLM were also concerned about the potential health effects of the contraceptive pill. They pointed out that as a result of other contraceptives being illegal, it was widely prescribed as a “cycle regulator” by Irish doctors, without consideration of suitability or potential side effects. Other contraceptives, such as the diaphragm, condoms, and the coil were available to middle-class patients through family planning clinics in Dublin, where patients would give a “donation” rather than a fee in order to navigate the law, or to women who were able to travel to the UK to obtain them. In 1973, the anti-contraception Irish Family League was founded. This group campaigned vigorously against the legalization of contraception, arguing it would lead to an increase in promiscuity in Ireland, especially among teenagers, and that if contraception was legalized, abortion would soon be too. Letters in newspapers and magazines from the general public also highlight the contentiousness of the issue; many were against the legalization of contraception for moral and religious reasons. Beginning in 1975, a feminist group called Irishwomen United (IWU) took up the contraception issue. The group was formed by women from radical and socialist backgrounds, and it differed from IWLM in that lesbian women represented a significant presence in the group.9 Although the group used tactics similar to the IWLM, such as direct action and consciousness raising, IWU was arguably more politicized.10 IWU held weekly meetings in Dublin and organized joint action through pickets, public meetings, consciousness-raising groups, and workshops on issues such as women in trade unions, contraception, social welfare, and political theory. Like American feminists and the IWLM before them, members of IWU were concerned with the side effects of the contraceptive pill, the class and geographic disparities with regard to contraception access, and the medicalization of women’s bodies. As a result, the group organized a Contraception Workshop, which eventually led to the establishment of the Contraception Action Programme (CAP) in 1976. CAP also included members from other interested groups including the Labour Party Council for Women, Family Planning Services, the Irish Family Planning Association, and the North Dublin Social Workers, but it was predominantly women members of IWU who were behind the campaign. However, many members became involved in the newly founded Women’s Right to Choose Group and Anti-Amendment Campaigns, which both campaigned against the proposals for the pro-life eighth amendment of the Irish constitution. Moreover, through their activism, Irish feminist groups in the 1970s provided an important legacy for future reproductive rights campaigns, a legacy which is still felt today. In particular, in the last five years, a campaign to repeal the eighth amendment has gained considerable support in Ireland, and numerous pro-choice groups have mobilized, including the Abortion Rights Campaign, founded in 2012, and the Coalition to Repeal the Eighth Amendment, founded in 2013. In 2016 at least 9 Irish women had abortions in the UK per day, while a significant number received abortion pills which were posted to addresses in Northern Ireland. Certainly, there are parallels with the debates which took place over the legalization of contraception in 1970s Ireland, with feminist activists and human rights organization Amnesty International calling out the hypocrisy of Ireland’s abortion laws. Moreover, as with access to contraception in the 1970s before legalization, class is an important factor in access to abortion in the UK, given the high costs involved for the procedure and travel. With a referendum on the eighth amendment due to take place in 2018, it is clear that activism on both sides of the debate will play a significant role leading up to the vote. Linda Connolly, The Irish Women’s Movement: From Revolution to Devolution (Palgrave Macmillan, 2003). Chrystel Hug, The Politics of Sexual Morality in Ireland (Palgrave Macmillan, 1999). Sandra McAvoy, “The Regulation of Sexuality in the Irish Free State, 1929-1935,” in E. Malcolm and G. Jones, eds., Medicine, Disease and the State in Ireland, 1650-1940, (Cork University Press, 1999). Nell McCafferty, Nell, (Dublin: Penguin Ireland, 2004), 223. Return to text. Mary Kenny, Something of Myself And Others (Dublin: Liberties Press, 2013), 153. Return to text. June Levine, Sisters: The Personal Story of an Irish Feminist, New Edition (Cork: Attic Press, 2009), 144. Return to text. The BBC provides a video of the Contraceptive Train and an interview with Nell McCafferty, IWLM member. Return to text. “Onslaughts On Faith Deplored,” Irish Press, May 24, 1971, 4. Return to text. See: Sandra McAvoy, “A Perpetual Nightmare. Women, Fertility Control and the Irish State: The 1935 Ban On Contraceptives,” in Margaret Preston and Margaret Ó hÓgartaigh, eds., Gender and Medicine in Ireland 1700-1950 (Syracuse NY: Syracuse University Press, 2012) and Lindsey Earner-Byrne, “Moral Prescription: The Irish Medical Profession, The Roman Catholic Church and The Prohibition of Birth Control in Twentieth-Century Ireland,” in Catherine Cox and Maria Luddy, eds., Cultures of Care in Irish Medical History, 1750-1950 (London: Palgrave, 2010). Return to text. June Levine, Sisters, 139. Return to text. Levine, Sisters, 138. Return to text. Linda Connolly, The Irish Women’s Movement: From Revolution to Devolution (London: Palgrave Macmillan, 2003), 131. Return to text. Connolly, The Irish Women’s Movement, 130-1. Return to text. Irish Independent, October 11, 1979, 12. Return to text. “The Life and Death of the Contraception Campaign,” Irish Feminist Review (Dublin: Women’s Community Press, 1984), 35. Return to text.